Standing desks are all the rage these days. Study after study tells us that sitting at a desk all day is basically a death sentence, and we need to make the necessary changes to our traditional work environments that prevent us from putting our health first. Interestingly enough, a brand new study from the University of Exeter and the University of London discovered that sitting for long periods actually doesn’t increase your risk of dying sooner. In fact, researchers concluded that standing in one spot all day at work isn’t really all that better than sitting. For the study, researchers looked at health data from more than 5,000 people taken over a 16-year period, including the amount of time they spent sitting at work or at home, as well as the amount of time they spent walking or engaging in other forms of physical activity. Even after setting controls for factors like general health and diet, the researchers found that a higher risk of death was not associated with the amount of time spent sitting. How could this be when so many other studies have shown such depressing results about the link between sitting and shorter lifespans? For this particular study, researchers believe that it has more to do with lack of movement than simply just sitting. Despite how popular it’s become to swap out your desk chairs for a standing desk, many people who follow the trend often do end up experiencing the unfortunate side effects of standing in one place for too long. In an interesting story from The Washington Post, a woman goes into great detail about how she took the standing desk challenge and ended up with a fleeting numbness in her toes. After consulting her doctor, she discovered that standing for too long had been causing her to hyperextend one knee, putting excess pressure on the fibular nerve. The same thing can happen if you cross your legs while sitting and leaving them in that position for too long. When you force yourself to stand still, your legs never get a break from holding your body weight. When walking, however, each leg and foot is lifted and given a short enough break that may make all the difference in preventing or minimizing leg muscle fatigue, joint pain, swelling in the calves or ankles and sore feet. 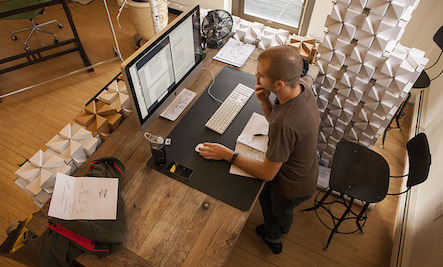 Of course, the use of standing desks may energize people and encourage them to move around much more often compared to the use of chairs for sitting, in which case standing may be better than sticking to a regular desk chair. Without regular movement, however, it may not be beneficial at all. Regardless of whether you decide to sit or stand, make sure you take at least a 2- to 5-minute break every 20 to 40 minutes. Walk around your office, go to the bathroom, grab a cup of coffee, do some stretching or even get down on the ground to see how many pushups you can do. Our bodies were meant to move! Working in an office environment doesn’t exactly make that easy, but it certainly isn’t impossible. I've stood for years and use a standing desk. Works well for me. And, please, not so fast. "Another possible explanation is that the absence of any associations between sitting and mortality is attributable to a protective effect of the high volumes of daily walking reported in the Whitehall II cohort. The public transport infrastructure in London is such that London-based employees are far likelier to stand (on buses and trains) or walk during their commute to work than those residing in other areas of the country. This is reflected in the mean reported daily walking time for the current sample (42.68âÂ±â22.60âmin) which is over double the reported UK average (measured in the latter using an activity diary rather than a self-report questionnaire). A number of prospective cohort studies have demonstrated that both habitual active transport and daily walking are inversely associated with risk for mortality. IF there were EVER a "normal" posture for humans, over most of history, that we probably should do more often, it might be squatting. Not.Standing.All.Day. G'head....squat more! ....Shifting weight, stepping-in-place, stretches, etc., helps temporarily, but cannot do enough to relieve the pain that happens from chronic standing. Trying to walk on a treadmill while doing hand-work or reading anything, is darn near impossible....and also fails to relieve the pain of chronic standing, with or without 'shifting in place'.